Tell you what: let me give you a few fascinating facts about crocodiles. After you have read this blog, send me your thoughts in the Comments bar. I would love to hear from you! Fact No 1: Crocodiles are currently the biggest reptiles on Earth. After the great catastrophe that felled the dinosaurs around sixty million years ago, the remaining reptiles had to adapt to being smaller and less conspicuous. The crocodile with its semi-aquatic lifestyle could stay unchanged. Today the Nile crocodile that we see on Kaingo can reach up to 6.5m in length and weigh a hefty ton! Fact no 2: There are no natural crocodiles in Europe. Europe is a cold place. 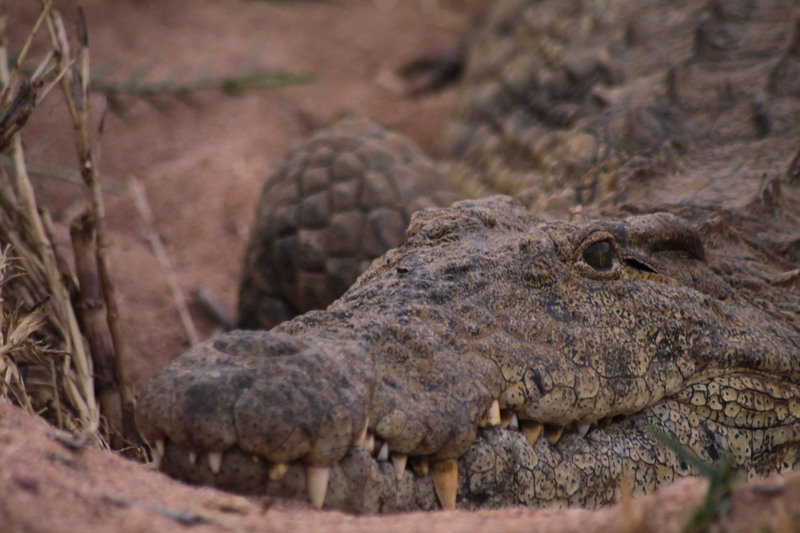 Food scarcity and inclement weather have caused crocodile to prefer warmer climates. Being cold-blooded does not help either! Movement in cold is agonisingly slow at best, all but impossible in snowy or iced-up lakes. Fact no 3: There are thirteen surviving species of crocodile world over. Talk of an unlucky number! Many ancient crocodile populations perished because of rapid habitat changes or lack of reliable resources. The largest fossilised crocodile ever found was a chap called Sarcosuchus imperator; a beast of about twelve meters long with a weight of eight tonnes. Fact no 4: Crocs have very sophisticated hearts! Far from being heartless monsters they, in fact, have a four-chambered heart just like you and me. The major difference is that the crocodiles can regulate the destination of the blood pumped through the heart to the areas it is most needed. Most other reptiles have a much simpler three-chambered heart structure. Fact no 6: Crocs don’t chew their food. No wonder they suffer from halitosis! Crocodile teeth are made for gripping its prey. Chunks of meat are then torn off the prey by the ‘death roll’ and swallowed whole. They are known for ingesting stones and other hard objects to assist the stomach with digestion. These stones are very highly sought after in traditional African medicine. Fact no 8: About food; crocodiles will eat mainly fish, but occasionally also hunt mammals, birds and humans. There have even been records of hippo, rhino and elephant falling prey to a crocodile! People in rural areas and fisherman are most susceptible to crocodile attack, and even a tree meter long crocodile is powerful enough to overpower an adult human. Vigilance is key! Crocodiles will not readily attack boats or even humans walking on the edge of the water. Swimming in crock infested water is maybe not a smart idea. Fact no 10: Kaingo has a good population of crocodile. With our twelve kilometres of river frontage and soft sandy banks, it stands to reason that we have a good and stable population of crocodile. Often seen on a game drive to the Mokolo river, or when floating downstream on the river cruise, they hold a particular fascination to guides and guests alike. Keen to meet one in the flesh? I know I am!